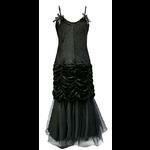 A black stretch cotton party dress from Hell Bunny with a sweetheart neckline and softly padded cups on the bust area. The bodice section has fabric covered decorative buttons at the centre front and the back has an elasticated panel with eyelet and black ribbon corset lacing. 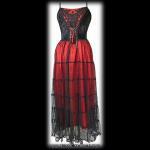 The black shoulder straps are adjustable and can be worn crossed over or straight. The skirt section of the dress has four channels, two at the front and two at the back, which can be adjusted so you can wear the dress as long or as short as you wish. Side zip fastening. Please note that the gloves shown in the images are not included with the dress. We do however have a large selection of arm length gloves in our Accessories section. 98% cotton 2% spandex. 40 deg C machine wash. Bust: 30" - 32" Waist: 26" - 28" Length from underarm: 29"
Bust: 32" - 34" Waist: 28" - 30" Length from underarm: 29"
Bust: 34" - 36" Waist: 30" - 32" Length from underarm: 29"
Bust: 36" - 38" Waist: 32" - 34" Length from underarm: 30"
Bust: 38" - 40" Waist: 34" - 36" Length from underarm: 30"